In the midst of remastering Van Morrison’s substantial and legendary catalog a special bonus has been included for long time fans and current converts. As an addendum to one of the greatest live concert releases of all time, Morrison’s 1974 LP It’s Too Late to Stop Now has been updated and expanded. 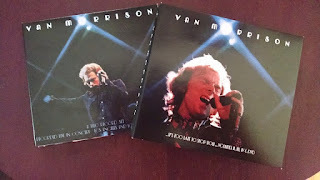 In addition to the remastered edition of the original album release, a new 3 CD/DVD set titled It’s Too Late to Stop Now,Volumes II, III, and IV and DVD has been compiled to offer an encompassing panoramic view of one of Van’s most legendary and well played tours. The ‘rock room’ will focus on the ‘new’ release segments as Morrison’s original album has soaked into the skin of listeners for over 40 years. Our real interest in the new unearthed gold! The original It’s Too late to Stop Now album was culled from eight sets of music professionally recorded to 16 track and hailing from concerts at the Troubadour in Los Angeles on May 23, 1973, the Santa Monica Civic Center on June 29 and two evenings at the Rainbow in London, England on July 23 and 24, 1973. This new collection adds 45 new tracks with no overlap with the original release. While there are a few repeats of songs, Van fans will have no issue comparing and contrasting the subtle differences in the sonics and performances. Each respective volume of the set contains extra music from each of the aforementioned evenings of music, with the DVD featuring about an hour of revealing pro-shot color footage from the London residency. Backing Van during these concerts is the 11 piece Caledonia Soul Orchestra including an amazing 5 piece string and 2 piece horn section offering Van a dramatic and lush backdrop in which to howl his soul/jazz/rock conglomerate. Well versed in light and shade the ‘big’ band swells dynamically, while entering into call and response relations with Van’s combustible and made up on the spot melodies. Clusters of notes float freely through musical space, never forced, always with a purpose. Jeff Labes piano and long time Van comrade John Platania on guitar deserve special notice as they are often the impetuous for taking many of the compositions to the next level. Extended artistic excursions abound with no song in Van's catalog spared renewal at the hands of the Soul Orchestra. 'Into the Mystic' and 'Caravan' are only two of the songs extended and re-imagined by this legendary line up. Volume II which is disc one of the new release contains an hour of music from the Troubadour concert in Los Angeles. The ‘rock room’ loves this performance greatly. Van and the band are loose, the crowd is out of control and the recording retains an intimacy and warmth that differentiates it from the other sets in the collection. ‘Come Running’ and ‘These Dreams of You’ open the collection with crisp rock and roll grooves. The balance of the instruments is perfection and Morrison is cool evening as it settles into night. ‘The Way Young Lovers Do’ is a revelation; a song from 1968’s Astral Weeks and left off of the original live album here it swirls with fresh pastels and bounding rhythmic interplay. The strings slide a sweet counter melody under the piano, bass, drums pulse. The track becomes bigger than its original bones and develops into obvious highlight performance. 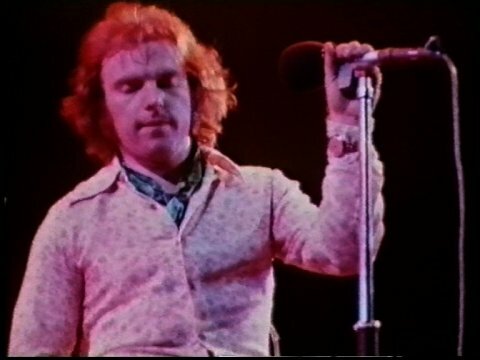 The same can be said for ‘Sweet Thing’, another Astral Weeks song which appears twice on the collection, changed by the band into a churning water wheel, plunging into the depths and returning to the surface with a flourish. The Troubadour performance also contains a special rendition of ‘Snow in San Anselmo’ freshly minted from the current Hard Nose the Highway album. A dramatic reading is expressed here with every minute detail explored by the band. David Hayes (bass) sits in the conductor’s seat while helping navigate the recent Morrison composition. The welcome release into double time mid song is stunning, even receiving an audible expression of excitement from Van following its bouncing around the walls. The whole package is on display, a multifaceted maelstrom of jazz rhythm and edgy horns. ‘Purple Heather’ and ‘Hard Nose the Highway’ are the other ‘current’ tracks that receive definitive and stirring renditions in the intimate confines of the Troubadour. These unique and inspired performances are nestled with the other set list pillars of the our such as ‘I Just Want to Make Love to You’ and ‘Cyprus Avenue’ both which appeared on the original 1974 release. This gig is a glass raised in the air good time, marked by Van’s audible investment in the tunes and the crowd sitting on the edge of their seat for the duration. Volume III follows with a substantial amount of music from the Santa Monica Civic Center on June 29, 1973. This particular disc is notable for the smoky blue vibe and amazing set of cover tunes. The sound is again perfect and the group plays the room delicately. The disc begins with a syrupy ‘I’ve Been Working’ that pounds rock to dust and is about as funky as one can get. 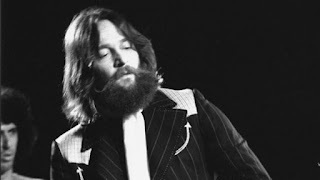 ‘No Way’, ‘Since I Fell for You’, ‘Buora Sera’, ‘Aint Nothing You Can Do’ and ‘Sonny Boy Williamson’s, ‘Take Your Hand Out of My Pocket’ are the serious series of specially chosen covers that illustrate the diversity of the band and the depth of Van’s musical knowledge and love. Louis Prima's 'Buora Sera', featured twice on this set, should have been on the original album. Van alternates funky, ethnic and full throttle rock and roll into one package here that finds the horns intertwining in New Orleans glory. What a wonderfully joyous track made up for its 1974 album absence with two stellar renditions! ‘Moonshine Whiskey’ makes an appearance here and results in a chill inducing version that is no doubt album release worthy; but in the ‘rock room’s humble opinion the real magic can be witnessed in the reading of ‘I Paid the Price’ where Van puts on his acoustic guitar and offers up one of the most soulful renditions on the collection. Moaning horns punctuate the song and John Platania channels his inner Robbie Robertson allowing Van to dig in and really let it go during the songs outro. Another version of the song is also represented on the Rainbow disc, in a performance that retains its own individual goodies. Take your pick, you cant go wrong. Almost acting as a culmination of the entire sonic experience, the final CD contains 78 minutes from July 23, 24, 1973 concerts at the Rainbow Theater in London. The DVD included with the package offers visuals of most of the ‘big’ songs performed over the two evenings. The band is practiced, brisk, sensual and full of attitude. Morrison is measured and tempered in the London shows, probably aware of the recording gear in some aspect. In the accompanying video he appears that he is in no way feeling any pain and leads the group stoically. What appears to be the opener from the second night, ‘Listen to the Lion’ leads off the London disc. Everything that has preceded in the collection has led up to these images of perfection.‘I Paid the Price’ makes another definitive appearance, in addition to two one timer’s for the collection, ‘Everyone’ and ‘Wild Children’. 'Wild Children' is a moment of note, as its organic sway and subtle interplay signals the upcoming Veedon Fleece album. Morrison really squeezes the juice from the Hard Nose the Highway tracks.These songs act as a celebration and a final stamp on the beautiful built relationship between Van and the Caledonia Soul Orchestra during their time together. 'I Just Want to Make Love to You' makes is finest statement of the concerts with a blatant and horny expression. The strings a hazy shade of navy and the crowd singing back at the band sum up the experience of these shows.‘Domino’, ‘Caravan’ and ‘Cyprus Avenue’ find Van drawing attention to the group and just sitting back and enjoying the ride. The London concerts representation on this collection could act as a complete release on their own merits. The music is that good. There is not a sour note to be had on this entire collection. Following this tour and by 1974 Van will have disposed of the big band and returned to the road with a four piece band featuring him on guitar, vocals and sax. This release is well overdue for documenting a peak in Morrison’s career when his music wore just one of the many guises it has taken on over his fifty plus year career. One of the best collections of music in rock history has thankfully been expanded to reveal a grand scope of newly rediscovered and ground breaking performances. It's like getting three new live albums! 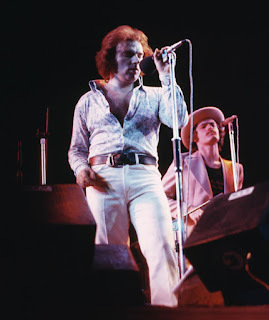 The recordings find Morrison’s vocals perhaps at their most expressive, with every enunciation and fluxuation leading to elongated spillway breaths, or succinct percussive vocal additions. From gritty to glorious angel choir Van lets go with groans of ecstasy as the band carries him away. These moments are captured along with the times where Van seems in awe of their collaborative skills. These recordings are timeless, some of the greatest concert captures you will ever here, and now they exist in a nice big package, immortalized and ready for our enjoyment.